Bigger’s Better? In Higher Ed’s Amenities Arms Race, Bigger’s Just Bigger! That depiction may at first seem hyperbolic, but even a cursory glance at many of today’s college campuses reveals that the “arms race” described by Goldrick-Rab is real. Lush new dormitories, recreation facilities, student activity centers, libraries, and lecture halls now dot the collegiate landscape, embodying the idea that students must be appeased with upper-middle class comforts if universities are to vie for their tuition dollars. In this competition, however, there are no real “winners,” except perhaps for construction companies and architects being paid to make every amenity bigger, better, and more impressive than the next. Recruiters can use stylish buildings and new playspaces to lure prospective students, but unwary taxpayers, parents, and student borrowers pay the price. Emphasizing amenities over education also does a disservice to the faculty and students more interested in academic pursuits. 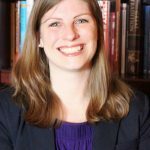 A recent National Bureau of Economic Research (NBER) paper found, perhaps not surprisingly, that demand for high-quality academics is limited to only the best and brightest students, while wealthy students with low academic aptitude have the strongest demand for recreational amenities. In such an environment, university leaders likely feel financial pressure to cater more to the lowest common denominator. In North Carolina, such commercialization of higher education has been on full display in recent years. 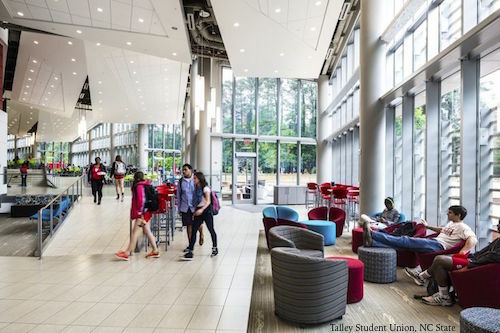 North Carolina State University has been especially intent on “keeping up with the Joneses.” The university has changed significantly in the past 15 years. Its enrollment has expanded. Its national reputation has improved. And its endowment is poised to crack $1 billion this year. But perhaps the most noticeable changes have come in the form of new campus construction and renovation. Harrelson Hall, the iconic round classroom building that watched over the Brickyard for half a century, has been demolished. Gone too are the last vestiges of the old Riddick Stadium, which hosted its final football game in 1965. By 2000, only one set of concrete bleachers remained. Now those, too, have disappeared. New classrooms, offices, and student gathering spaces have replaced many old NC State landmarks. To some extent, this makes sense. For example, few will lament the demolition of Harrelson Hall’s “low-hanging ceilings, pie-shaped classrooms, [and] confusing corridors.” But other changes seem to be overkill. Other lavish projects on the university’s campus, however, have required or will require significant funding from state taxpayers. For example, the behemoth, ultramodern Hunt Library, which opened in 2013, cost the public $115.2 million, in addition to more than $4 million in annual operating costs. And NC State’s Physical Master Plan, released in 2014, outlines the university’s vision of “world-class facilities and surroundings.” It includes 17 key projects across the university’s 2000-acre campus: “The built environment shall be of the highest quality, responding to campus and ecological contexts, and contributing to the traditions and missions of NC State University. Each project, however large or small, is a source of pride for the community and measurably moves toward making NC State a better place.” This “source of pride,” if realized, will also be a source of significant future spending. Unfortunately, in North Carolina, NC State is not alone in its belief that, in terms of construction, more and bigger equals better. Duke University and UNC-Chapel Hill have built their own impressive amenities. And High Point University, which enrolls just around 4,500 students, has since 2005 “poured some $700 million—with the majority financed by borrowing and student fees—into refurbishing and expanding its campus….” The Connect NC Bond, passed in 2016, will provide $980 million for state-of-the-art buildings (or renovations) at the University of North Carolina system’s 16 campuses. Despite claims to the contrary, however, most of these universities don’t need more space or more construction. Take NC State as an example. Its own data show that, after housing is excluded, only 20 percent of campus space is allocated for instruction and study. Research takes up 17 percent of space. But support, office space, and other non-education-related spaces make up more than 60 percent of the campus! Although the campus “arms race” is an old problem, its costs have now climbed to alarming proportions. NBER found that in 2007, the ratio of amenity to academic spending was 0.51 across four-year public and private non-profit schools. The problem often seems intractable. But there are national and local solutions that can help. At the national level, Professor Goldrick-Rab has suggested that the maximum amount that students can borrow should be lower. Allowing students to borrow large amounts of money, she says, enables colleges to overspend on amenities. She suggests the federal government should focus on grants to low-income students instead. At the local level, public universities and small schools can refocus to compete on price instead of pomp. To some extent, this shift has already begun. But public universities can (and should) do more. The UNC system can be a leader in this effort. The first step should be to improve its space utilization standards, which we have written about here. The system should also exercise more oversight over capital projects. At the same time, legislators and schools should work together to continue to keep tuition and fees low, and to question more closely administrators’ claims about the “need” for trendy new building projects. Together, such reforms will refocus higher education from accessories to essentials. If these issues are ignored, however, expect more university debt and more questionable taxpayer spending in the future.